When working to build a strong Instagram following, there are two paths. You can take the slow and plodding, manual road of following and interacting with fellow users, or the much faster route of using powerful free tools to build your audience. It is this second option that allows businesses and individuals alike to rapidly grow their Instagram following and generate more and better engagement in the process. But you can't use just any app! Soooo many apps. Which one to choose? There is a rightly justified fear that automated apps can produce fake followers and actually hurt more than they help. If you choose the wrong apps, this can be true – it's a big risk that can almost immediately hinder your ability to use this platform effectively from a marketing perspective. Those Instagram apps that go through and automatically like everyone’s profile under a given hashtag are so passe – and they’re also likely to get you banned from Insta too. Each Instagram follower’s app that just adds people automatically was never an effective means of gathering “real” followers. While with such a followers Instagram app you may gather a large following quickly, your audience will likely be disengaged, from the wrong location, and not interested in buying what you’re selling. What’s a good Instagram followers app? So what's the difference between the good and bad apps? An effective Instagram follower app needs to automate, reduce input requirements, be scalable, and ultimately save you time, all while producing real followers for your account. Despite all of this, it's not a magic wand that will rapidly grow your following. You will need to invest some effort in the process. Engagement and content still drive success with Instagram, and both require real humans interacting with the content in that account. But a good app is a powerful tool when wielded by a smart marketer. It can provide positive return on investment, reduced cost to implement and optimize on Instagram, and a better overall experience for you and your marketing campaigns. When choosing an app for your Instagram efforts, there are five factors you should take into consideration. A good Instagram follower app should automate one or more common tasks. There are plenty of long, slow, boring tasks you need to perform to use Instagram effectively – cutting down on any one of those is a benefit. Hashtag monitoring is a great example. A tool that can actively monitor hashtags, provide data on popularity, or connect you with relevant followers based on hashtag activity is a useful one. Most marketers that are using Instagram are using it because it’s a brilliant way to interact with your audience – for free – and we don’t want to take away from that. High cost to own, or apps that charge per follower we have discounted as cost prohibitive. There may be paid updates that allow you to enhance your efforts even further, but to get started and make sure each tool is a good fit. A good app should be able to grow with your team. It should be just as useful with 100 followers as with 10,000. It should also help you to scale at that level without having to put more work in. A great example is the ability to source content from customers or followers. Monitoring services that pull discussions about your product or company allow you to highlight good content without having to spend hours building your own. Your app should save time in as many ways as possible. Scheduling tools are a prime example – allowing you to preload Instagram posts days or even weeks in advance, reducing how often your team needs to create new posts at the last minute. Another great example is content-discovery apps. A tool that helps you find new content, reshare content from other users (who will in turn follow you), and build a steady stream of high quality posts will save you time and result in new followers. This is the bottom line. If the app you are using cannot produce real, active, and engaged followers, what's the point? A high follower count is just a vanity metric without engagement to back it up. Good apps include tools like contest managers and engagement boosters to help you achieve this goal. If you can find an app that checks all or nearly all of these boxes, it can be a powerful resource that allows you to get more done with less investment. To put it simply, your Instagram account will grow rapidly – but not too rapidly, or Instagram will shut down your account! - without the huge manual investment you're currently putting in. Fortunately, there are a lot of good apps already out there that check these boxes. To help you get started immediately, we've gathered six of them that represent the different types of Instagram followers and management apps that are on the market. 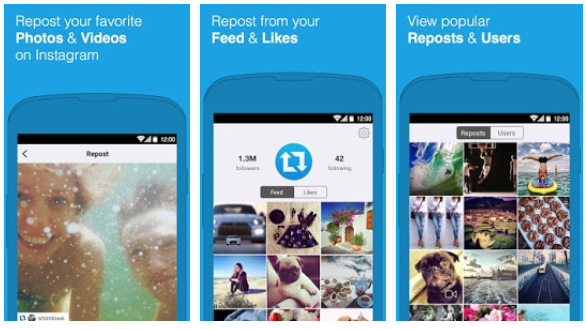 Regram allows users to quickly and easily repost content from other users on Instagram. Available as an iOS app, it is a perfect fit for brands whose customers post images of their products. If you run a contest, or if people share images related to your brand frequently, this is a great way to amplify those messages with a couple of quick taps. Actionable Regram task to obtain more followers: Run a regram competition where followers regram your comp picture – make sure it’s a good one! The added engagement from your side as a brand will drive new followers almost every time, by enticing their followers to check you out. Later is a free scheduling tool designed specifically for Instagram. While there are other scheduling tools that work in tandem across several social networks, this one is solely for Instagram posts, and is used by many top brands like Yelp and The Huffington Post. With it, you can upload posts from your computer, plan and schedule, manage multiple accounts, and easily repost content from the web. Actionable Latergramme task to obtain more followers: 3pm coffee break time is when most people at work are getting bored. Schedule your posts for around this time and watch your engagement grow. Iconosquare is a Swiss army knife for Instagram. It offers several tools packaged together for both casual and power users. With it you can post comments, like and share directly from their interface, save photos from the web, create albums, and follow/unfollow people directly in a single non-mobile interface. It also has tools for photo and video contests, and several analysis tools including engagement tracking, content visualization, rolling month analysis, and many others. These more powerful tools cost money after the trial expires but several other tools included are free. Actionable Iconosquare task to obtain more followers: Use Iconosquare’s powerful analytics to identify your followers with the largest reach – and then start targeting their fans. Repost is an app for either iOS or Android that lets you quickly repost content from your likes, hashtag and user searches, or popular selections within the app. It's a useful tool for those that are producing a large number of posts on a regular basis and need to be able to find new content fast. Actionable Repost task to obtain more followers: Understand your audience – don’t just try and sell them your product. Find funny hashtags related to your audience (e.g. #auspol, #tumblrtextposts) and get to reposting. The more entertaining your account is, the more followers you’ll be getting. Though, make sure that your given meme hasn’t already done the rounds! Collecto has a free version that allows you access to a good number of interesting statistics and search tools related to your account. Free users can browse Instagram in a browser, view their personal Instagram stats, or use the powerful search tools to collate content and follow other users. Paid users are then able to access more features including album creation, enhanced tag and filter-based browsing and content syndication via RSS feed. Actionable Collecto task to obtain more followers: View which of your posts were the most successful by the location you posted from and focus in on gaining more followers in the area by tagging and posting from common locations nearby. 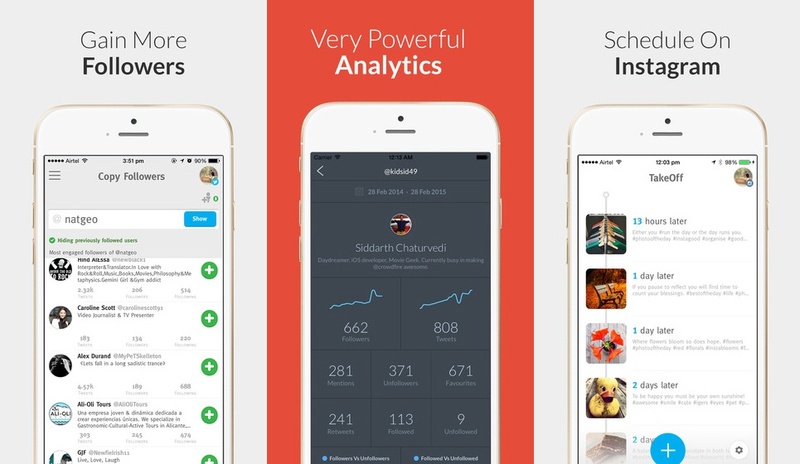 Crowdfire is an Instagram and Twitter follower growth tool. It is free and web-based and allows you to quickly look at your non-followers, fans, recent unfollowers, recent followers, and more to see who is a good follower for you and who you might follow back. It provides tools to help locate ideal followers, as well as a web-based composition tool and schedule recommendation tool to ensure you are posting at the optimal time for your account. Actionable Crowdfire task to obtain more followers: Use Crowdfire’s Copy Followers feature to find other brand’s followers and instantly add the most interactive ones to your account! Remember, there’s a max of 60 adds per day. Instagram's users follow very specific patterns. If you can identify and leverage these patterns in your marketing efforts, you can grow your following rapidly. That's what these tools allow you to do. With the right follower app, you can boost your Instagram account with new, highly targeted content that matches what your ideal prospect is looking for. Done right, this is the perfect way to grow your audience without risking having those fake followers that are just a random click in a haystack. Be sure to match the tools you select with your specific goals. Whether it's follower growth, increased engagement, or content production, there is a tool that will help you get more done in less time without having to spend a fortune. The key is to ensure the tools you choose are matched to your needs. If you can do this, you'll get more out of Instagram and more out of the relationships you build with it. What’s the point in gaining Instagram followers if they don’t buy your product? What’s the point in having Instagram followers who never like your pics? What’s the point in having an Instagram account at all if we aren’t measuring how effect we are on all fronts? While it’s all well and good to gain a large following, it’s how your followers feel about and interact with your brand that the new wave of marketing is really about. Luckily, thanks to these apps like Iconosquare, we’re able to hone in on specific analytics to determine how effective each Instagram campaign that we run is. When you really start planning your campaigns and tracking their successes, this is when you’ll start to experience organic growth, rather than searching out followers yourself. Gaining Instagram followers should never be your main goal. Building an Instagram account that speaks to your main audience while showing a strong brand image will ultimately generate follows on its own, once you’ve hit around the 1000 followers mark. 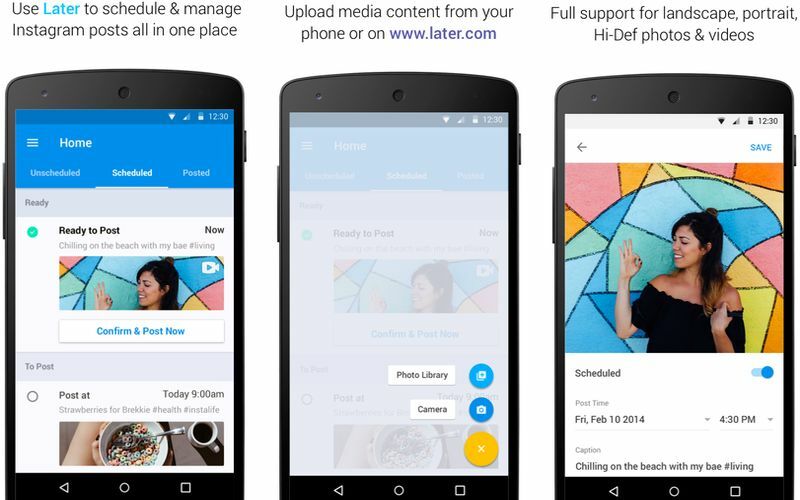 What is important is nailing your strategy first, and then using helper apps to widen your reach. At Hello Social we can help with strategy, consulting, even your next Instagram campaign! Make sure to give us a call or a Tweet if you’d like to learn more about how we can help to propel your business further on Instagram.